SolarWinds Orion products supports binding Secure Sockets Layer (SSL) certificates to your Orion server port to enable secure communications with the Orion Web Console. Due to security concerns, SolarWinds recommends that you disable SSL v3.0 and earlier. Select the Enable HTTPS option in the Configuration Wizard to bind an existing certificate to your Orion server port or create a certificate for binding. The process is automatic when this option is selected. To configure your website bindings manually or leave your current website configuration as it is, select Skip website binding in the Configuration Wizard. SolarWinds recommends that you install a certificate from a certificate authority before adding the bindings to the website, and that you enable the certificate auto enrollment group policy to prevent the certificate from generating browser errors. This information refers to SolarWinds products running on Orion Platform version 2017.1. For configuration steps for older versions of the product, see Configure the Orion Web Console for SSL (deprecated). Choose the certificate you want to use. Certificates with a green check mark are least likely to generate browser warnings. The Configuration Wizard enables the Orion Web Console to use SSL for the specified port, adds the website binding to the Orion Web Console, and forces the website to use HTTPS by default. 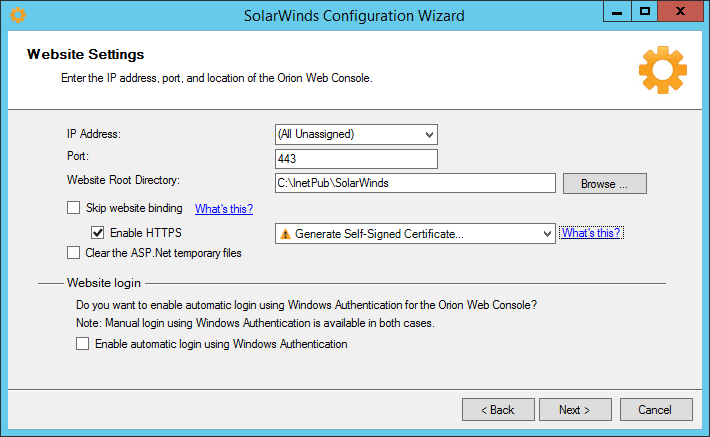 After the Configuration Wizard is finished, the Orion Web Console opens using HTTPS. If you used a certificate with a green check mark next to it, there should be no browser warnings. If you used a certificate with a yellow warning sign next to it, you may have a browser warning. You can generate a self-signed certificate directly in the Configuration Wizard. Scroll to the bottom of the list and select Generate Self-Signed Certificate. A self-signed certificate is issued to the machine host name or fully qualified domain name (FQDN) when the computer is part of a domain, and the certificate is added to the trusted certificate store. After the Configuration Wizard is finished, the Orion Web Console opens using HTTPS. The certificate authority for self-signed certificates is the computer hosting your Orion server. Depending on your security and group policy settings, the Orion Web Console may generate browser errors because the certificate was not issued by a known certificate authority. 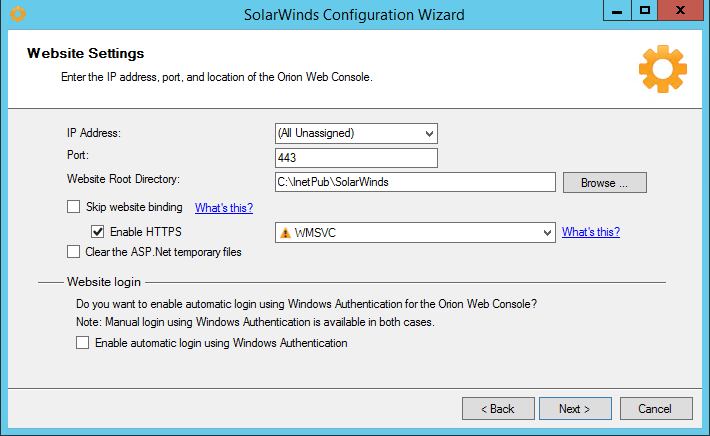 You can still use the Configuration Wizard to add the binding to your Orion Web Console after you have installed a SolarWinds Orion product. You must install an SSL certificate on the Orion server before performing the following steps. Choose the installed certificate. If the certificate does not show in the list, review how certificates are categorized. Some certificates are not valid. Client certificates or certificates that have expired or use an untrusted certificate authority are invalid and do not display on the list.